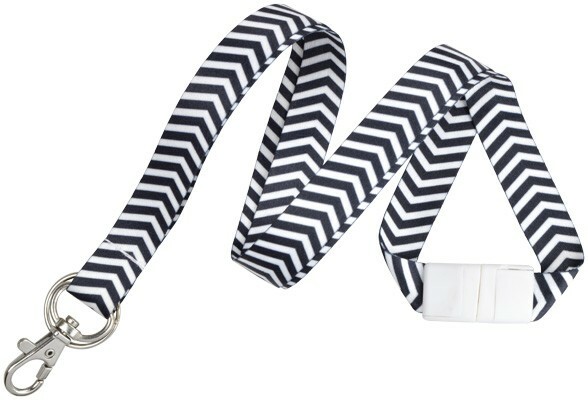 5/8" polyester lanyard with a dye-sublimated zig-zag pattern. Lanyard material is white, with zig-zag colors available in black (SKU 2138-6281), blue (SKU 2138-6283), emerald (SKU 2138-6284) and nectarine (SKU 2138-6285). 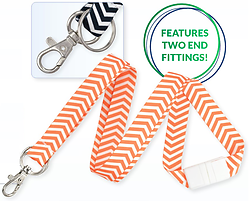 Two end fittings make this a versatile lanyard: a trigger snap hook and a split key ring. Includes a white breakaway. BREAKAWAY PERFORMANCE WILL VARY AND LANYARDS WILL NOT BREAK AWAY UNDER ALL CONDITIONS. CUSTOMERS SHOULD TEST THE BREAK-AWAY FEATURE FOR SUITABILITY FOR THEIR USE AND ENVIRONMENT. THIS PRODUCT IS SUBJECT TO A LIMITED WARRANTY. SELLER WARRANTS TO THE ORIGINAL PURCHASER FOR USE THAT THE GOODS OR ANY COMPONENT THEREOF WILL BE FREE FROM DEFECTS IN WORKMANSHIP FOR A PERIOD OF ONE YEAR FROM THE DATE OF PURCHASE. SELLER'S SOLE LIABILITY AND THE PURCHASER'S SOLE REMEDY FOR A FAILURE OF GOODS UNDER THIS LIMITED WARRANTY, AND FOR ANY AND ALL CLAIMS ARISING OUT OF THE PURCHASE AND USE OF THE GOODS, SHALL BE LIMITED TO THE REPAIR OR REPLACEMENT OF THE GOODS THAT DO NOT CONFORM TO THIS WARRANTY. THERE ARE NO EXPRESS OR IMPLIED WARRANTIES COVERING THESE GOODS OTHER THAN AS SET FORTH ABOVE.